3. The Glacier Express carries guests in comfortable panorama cars through the most beautiful areas of the Alps from St.Moritz to Zermatt. During this journey, it crosses 291 bridges and goes through 91 tunnels. In Switzerland, a country in love with its railways, the Glacier Express is the most popular and attractive of her trains. The slowest express train in the world travels over 291 kilometers of tracks and 291 bridges while going through 91 tunnels and climbing to the top of the Oberalp Pass at 2033 meters. The trip is an eight-hour experience with one highlight leading tot the next. Just after leaving St.Moritz, the composition travels through the UNESCO World Heritage Site of Abula on the Rhatische Bahn tracks. Here one can see and experience the world famous Landwasser Viaduct and the spiral tunnel between Preda and Bergun. Travelers on the Glacier Express cannot put away their cameras for a moment, because the attractions line up like a strand of pearls with mountain forests, alpine meadows, mountain brooks and streams, the arches of the Landwasser Viaduct, the UNESCO World Heritage Site of Abula, the Rhine Gorge with its jagged landscape, the Oberalp Pass with its mountain lake, glaciers and peaks, and on and on. 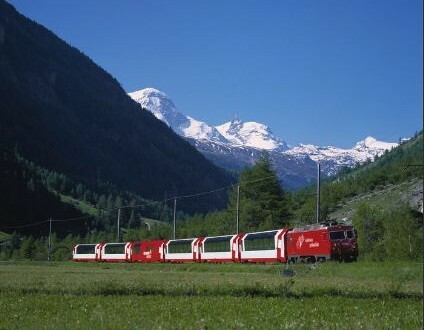 After Visp, the Glacier Express passes through the deepest cleft valley in Switzerland, the Nikolai Valley. And the finale, arrival at Zermatt with the magnificent Matterhorn village. 4. The Matterhorn, the king of mountains, is the most photographed mountain in the world. It is myth and emblem for Alpinists and photographers alike, as well as Switzerland’s most famous landmark and symbol. In 2015, Zermatt will celebrate its mountain in the context of numerous events, all relating to the first ascent of the famous mountain by Zermatt mountain guides and Englishman Edward Wymper in 1865, 150 years ago. The Matterhorn has a magic attraction, both for day-trippers who love the view and for Alpinists who love a challenge and dream of climbing the peak of the Matterhorn at least once in their lives. The popular ascent route is the Hornligrat. Thanks to its shape and its free-standing position, the Matterhorn is considered to be the epitome of a mountain. There is no better known mountain in the world whose natural shape is so close to a pyramid. 100 million years ago, enormous forces brought Africa closer to Europe and 50 million years later, as the rock masses folded and deformed, the Matterhorn was born from the rock thrusting upwards. Since Hornlihutte is closed due to renovation, the Matterhorn now has a unique base camp for mountaineers. 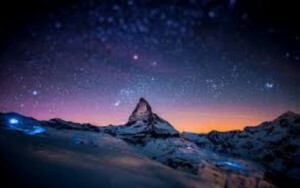 The Matterhorn is absolutely beautiful not only during day but also during night. Many visitors love to view the sunset and sunrise that changes the color on the Matterhorn.